Randy Moore of Lawrenceville had a problem. In April, just a month before embarking on a medical mission trip to Haiti, he needed a pair of ultrasound machines to send abroad. Moore, a home infusion nurse who’s taken more than 100 mission trips to Haiti, knows the great need for the equipment in that country. According to the CIA World Factbook, Haiti has the highest infant mortality rate in the Western Hemisphere. In 2017, there were nearly 47 infant deaths for every 1,000 live births in Haiti. Moore reached out to longtime friend Jason Shelnutt, CEO of Georgia Urology, asking if the practice had any extra ultrasound machines. Moore was in luck. “Jason sent me a text saying that he found two machines in the Georgia Urology warehouse that we were welcome to have,” Moore recalled. 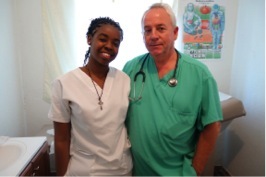 Working directly with the Sarepta International Foundation, a Haitian non-profit, Moore helps improve resources and train staff at the 42-bed Cap Haitien Hospital in Cap Haitien and Clinic Saint Bertin in the remote village of Tibouk. He knew having ultrasounds at these locations would be a game changer. Moore made his first trip to Haiti in 2009 when he joined a group of friends as part of a medical mission team. He said he instantly fell in love with the country and began making repeat trips. After the installation and implementation of the Georgia Urology ultrasound machines in Haiti, Moore will be one step closer to his goal. In the future, he hopes to organize a medical mission team made up of Georgia Urology physicians to help train Haitian doctors. What Advances Have Been Made in the Diagnosis and Treatment of Prostate Cancer?